This post contains a table of contents for the Caliente family with synopsis of each post if you don’t want to read them all (so spoilers obviously). I try to make each round’s series of posts work as a stand alone short story so each should make sense on its own but if you want to catch up on what happened previously (or check if my writing had made any progress :P) you can follow the links to read them or if you want to refresh your memory or just want to get a fast update of what’s been going on read the synopsis in italic. I will update this post after each new update for this family is published. I created Dina and Nina for a reconstruction of my Sims2 Pleasantview, I have given up on that neighborhood but I liked Dina and Nina and decided to move them in this save, they were the fourth family to join the neighborhood. At one point the household consisted of Nina, her fiancee Dave, their daughter Rosie, Dina, her wife Nala and their adopted daughter Sara so I decided to split them up, and that is how this Caliente family got their new home. At the beginning of this story Dina had just reached elder age, had retired from her job as the Leader of The Free World. She and Nala are divorced and both their daughters Sara and Summer are young adults. This post is told form Dina’s POV.In this post we meet the Caliente women, Dina and her two adopted daughters: Sara and Summer. We learn Dina had recently divorced her wife Nala after an affair. Dina had also recently retired following a successful political career, she was the Leader of The Free World and is very rich and famous, thus completing her lifetime ambition. Now she is focused on her two daughters who don’t really get along. Her house gets broken into but her daughter Sara deals with the burglar still causing Dina a lot of stress and her younger daughter Summer gets engaged to her longtime boyfriend Bradley Frail. This post is told from Sara’s POV. Summer had gotten pregnant with Bradley, shortly after her engagement, Dina had tried to push her into a marriage which she wasn’t ready for and she moved out to her other mother‘s house. Sara gets an offer from Alyssa Prentiss (her future mother in law) for a secret mission that would help the SPVD (where she works as a desk jockey for the forensics department) find evidence that would once again put their little town’s only convicted criminal Mortimer Goth behind bars. In return she would be promoted and become a full member of the police force. This post is told from Sara’s POV. Sara has lunch with the Big Boss, Dynamic DNA specialist Junior Hoves, they talk a little about their personal life, but the conversation soon steers to the offer Sara received from Alyssa Prentiss and Sara informs him she decided to accept it. Sara finally goes on assignment given to her by Alyssa Prentiss, she doesn’t find the bad guys where the SVPD expected them too but instead finds a message that seems to be left there for the police, she takes it and rushes back to the station. Her mother, Dina gets engaged to her girlfriend Justine Hooks. Sara brings back the found evidence to the station and gets promoted by Junior Hoves himself. The next day she stumbles in to her mother’s bachelorette party. The party is a blast for everyone but Sara who sees her aunt and tries to confront her guilt over her cousin’s suicide attempt. The party ends with Blair Hoves fainting and the ambulance’s arrival. With her mom and Justine gone to their honeymoon Sara is left home alone. 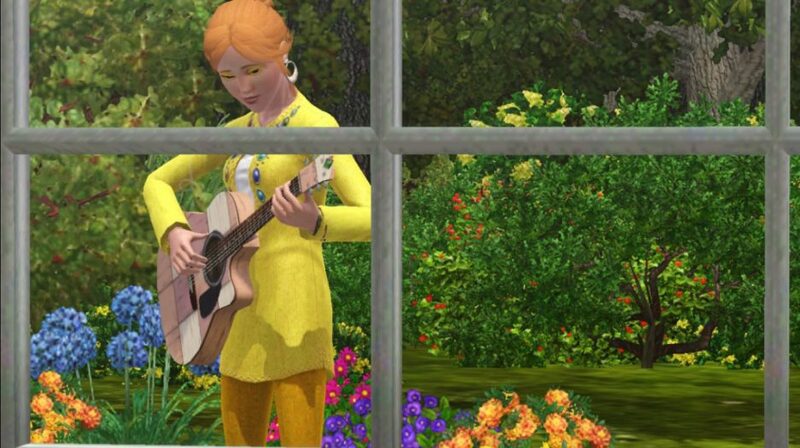 she reflects on her job and the event that shaped not only her career but her life and the life on many other sims in town…. Sara is a lieutenant at the SVPD, and two new officers join her team. Sara’s fiancee Jerod had moved in with her after a tragedy in which he lost his mother and his house. The event had a deep impact on him and he is still trying to recover.